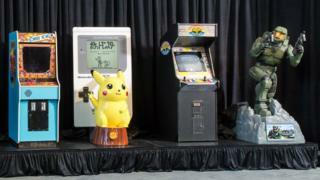 Donkey Kong and Pokemon Red and Green have been inducted into the World Video Game Hall of Fame. Halo: Combat Evolved and Street Fighter II were also honoured with places in the permanent exhibition at The Strong Museum of Play in Rochester, New York. They join titles such as Sonic the Hedgehog, The Sims, Doom, Pong and World of Warcraft. Tomb Raider, Resident Evil and Microsoft's Solitaire were nominated but failed to make the final list. The hall of fame was established in 2015, covering games played in an arcade, on a console, computer, handheld device or mobile phone. The games are chosen for their popularity, longevity and their influence on gaming, popular culture and society. Anyone can nominate a game, but the final selection is made on the advice of a panel of journalists, academics and gaming experts. This year's winners were chosen from a list of 12 finalists which also included Final Fantasy VII and Wii Sports. Following its release in 1981, an estimated 132,000 Donkey Kong arcade game cabinets were sold around the world - introducing us to an Italian plumber called Mario. "Without Donkey Kong there would be no Super Mario Bros," said Jon-Paul Dyson, director of The Strong's International Center for the History of Electronic Games (ICHEG). The original Pokemon game, released for the Nintendo Game Boy in 1996, was nominated in 2016 but failed to make that year's final selection. Since then, however, the franchise has received a boost in popularity and gained a new generation of fans with the launch of Pokemon Go. "Two decades after its inception and with the introduction of Pokemon Go, 'Poke-mania' shows little sign of fading," explained The Strong's associate curator, Shannon Symonds. Capcom's Street Fighter II allowed players to battle human opponents, "instantly attracting spectators and generating fierce tournament play", said Jeremy Saucier, assistant director of ICHIEG. He added that the "communal style of game play reinvigorated the arcade industry in the 1990s". When Microsoft launched the Xbox in 2001, more than half of the consoles sold came with Halo: Combat Evolved. The first-person multi-player game sold more than six million copies and has been followed up with sequels and spin-offs including novels and comics. Ms Symonds said the game was key in showing that consoles could be "just as effective, if not better, than a PC" for high-precision games, as well as "one of the strongest multiplayer experiences of its time". With the addition of this year's four winners, the World Video Games Hall of Fame now has 16 permanent exhibits. Its first entrants were Doom, Pong, Pac-Man, Super Mario Bros, Tetris and World of Warcraft. In 2016, another six games - Space Invaders, Sonic the Hedgehog, The Legend of Zelda, The Oregon Trail, Grand Theft Auto III and The Sims - were honoured. How worryingly addicted to Pokemon Go are you?